Ibiza. It may only be the Balearic’s third largest island but its reputation eclipses both Majorca and Minorca, and its very name immediately brings to mind stunning natural beauty and a lifestyle of glamour and unbridled hedonism. In other words its the perfect destination for a sailing holiday! By day you can charter a yacht or power/motor boat and cruise on the clear Mediterranean waters to one of the island’s 80 beaches and coves, by night you can moor at one of its five world-class marinas, before dining out in the splendid medieval Old Town or watching the sunset at Cafe del Mar in Sant Antoni… and then let yourself get swept along by the madness that is Ibiza’s nightlife! 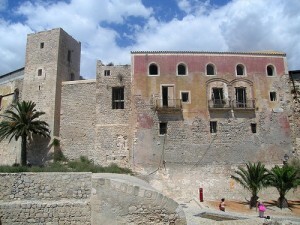 As with the other Balearic Islands, the natives of Ibiza (or Eivissa as it’s known locally) consider themselves Catalan not Spanish (despite legally being part of Spain), but thanks to the advent of tourism you’ll be able to get by in Spanish, English, German and most other major languages too. 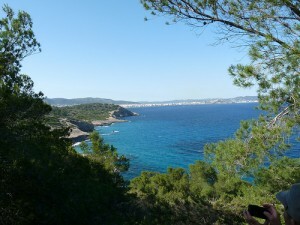 Geographically-speaking Ibiza has a rugged coastline, punctuated by white-sanded beaches – hence it’s nickname The White Isle – whilst the island’s idyllic interior is mostly pine forests, which is why it is also referred to as of one of the Balearics two ‘Pine Islands’ (the other being it’s smaller neighbour, Formentera). 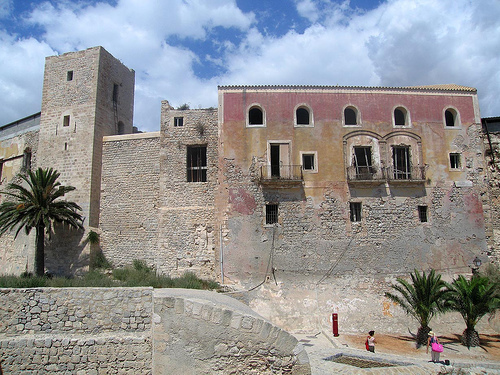 Life on the island centres around the capital, Ibiza Town, which started up as a Phoenician settlement way back in 700BC and is famous today for the majestic Dalt Vila (Upper Town) where a walled 16th Century fortress overlooks the rest of the capital’s Old Town. Under this ancient fortication the winding medieval lanes of Ibiza Town spider out and you’ll find plenty of boutique shops, trendy restaurants and hip bars – there’s even a lively gay scene in this cosmopolitan part of the isle. A bit further from the centre and you’ll find superclubs like Pacha, El Divino and Space, which together with the other major clubs on the island have made Ibiza the centre of the world for dance music over the last decade or two – at least during summer. Serving Ibiza Town by sea are both Botafoch Marina and Nueva Marina, where, as well as admiring the mega and luxury yachts of the rich and famous, you’ll be able to charter your own boat for setting sail and exploring. 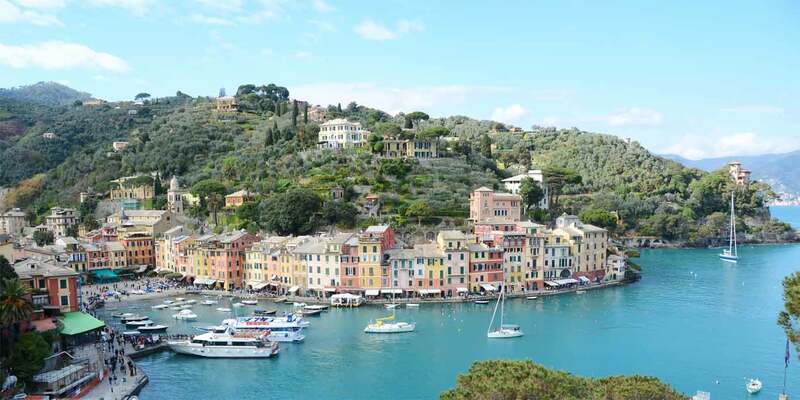 Even if your vessel isn’t the biggest of the bunch you’ll definitely feel like a jetsetter as the stylish elite of Spain and Europe stop off for their summer holidays and throng the marina restaurants in their Gucci shades and Chanel summer suits. It’s hard not to feel that you’re in the place to be. On the other side of the island, the Sant Antoni Sports Marina services Sant Antoni, Eivissas’s second largest town and another mecca for party-goers. Hippies have been gathering since the 1960s to watch the sunset over the sea from the rocks of Sant Antoni (aka San Antonio in Spanish) and this is definitely an Ibiza rite of passage (naturally it’s an even better view from your hire boat!). You’ll also find the legendary Cafe del Mar and Cafe Mambo bars here, serving cocktails to bronzed beauties and playing chill out tunes as the red disk of the sun dips below the horizon. However you might not want to linger too long in this district. Sant Antoni is also the epicentre of cheap package tourism on the island, and the town is characterised by unattractive high rise hotels, restaurants serving fish and chips, and screening episodes of Only Fools and Horses, and bars offering cut price drinks in a bid to capture the trade of passing lager louts. There are plenty of cool places too, but there’s an ugly side to Sant Antoni. 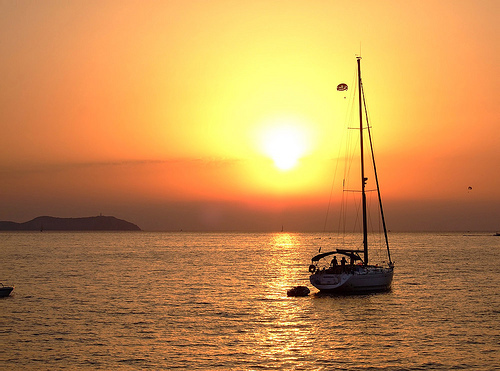 Chartering your own sailing yacht or motor/power boat will definitely give you the edge when it comes to exploring the more idyllic side of the White Isle. Whilst the young clubbers who arrive in droves every summer sleep off their hangovers on the overcrowded city beaches, you’ll be able to feel the sea breeze and head over to the likes of Cala Jondal, a secluded beach surrounded by pine-clad hills, where the jetset – or ‘wetset’ – escape the crowds; Portinanx, a family resort in a spectacular bay with three beaches, crystal clear waters and plenty of activities; or Las Salinas, a party beach by the island’s salt flats where the top Djs and film stars on holiday hang out. And that’s just the tip of the iceberg. Hire a boat and take a cruise and the options are endless! There’s more than beaches to be discovered too. Those who choose to go sailing in Ibiza will also be able to discover the likes of the Puig des Molins necropolis, a number of stunning caves with everything from painting, light shows and aquariums inside them, or simply hire a car and enjoy exploring the isle’s sleep forested interior of nature reserves, villages, windmills and more. In fact, outside of the main tourist season – June to mid September – can be the best time to visit Eivissa as both the wealthy wayfarers, with their luxury yachts, and the drunken hordes, with their hangovers and henna tattooes, have returned to their native countries. The off season reveals a romantic Ibiza rarely covered in the travel press, and best off all everything from hotels to sailing boat charters are much cheaper, whilst the weather from April to October is reliably good. There are plenty of flights arriving at Ibiza’s airport from Spain, UK and Germany, but another option would be to fly into Barcelona and charter a yacht in the Costa Brava from where you can sail over to the Balearics. Check our search engine above to compare prices of boat rentals. If you can’t find what you’re looking for then send us your request via our enquiry form instead.